It’s hard to believe that the 2018-2019 school year is only a couple of weeks or days away. With a brand-new school year just around the corner, do you already have a plan for your back-to-school expenses? Whether your kids start kindergarten or head off to the university this year, you can buy them everything they need without breaking your bank account. 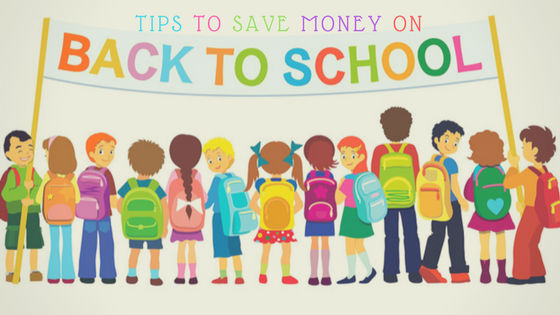 Get the most out of your hard earned money with these several tips to help you become a savvy back to school shopper this year! They take little effort on your part, but it has potential to save you thousands. 1. Reduce, reuse and recycle! Before you head to the store to buy brand new supplies, go through your home and take inventory on what you already have. Believe it or not, you might already have plenty of school supplies lying around your house. Check your drawers, closets and basement bins for any office supplies you were unaware you had that can save you money. Start by rounding up all of the office and school supplies you already own. Go through these items and determine what can be reused for the upcoming school year before you make your back-to-school list. Old school uniform from the previous school year that are still in good shape will give you no reason to buy a new one. Put them in a central location, like a plastic bin or on the dining room table, so you can make a list of what you have. Keep this list in your purse, or in the car, so you don’t forget it when you shop for school supplies. What do your children need for the school year? In addition, go through your kids’ closets and start sorting. Clothing that the kids have outgrown, and worn clothing, should be donated or tossed. Once you complete this “supply sweep,” you’ll have a clearer picture of what you actually need to buy. Ideally, the sweep will prevent you from buying something you already have on-hand. Garage sales can be a treasure trove of deals for back to school supplies. Backpacks, gently used shoes, clothing, and even school supplies can be picked up for a song. Start hitting up garage sales for everything you need. It takes time, but you can score some incredible bargains this way. You can also ask friends and family members to keep an eye out for you, while they shop at garage sales. You can also find awesome bargains at thrift stores. Clothing is dirt cheap, and many stores run sales specifically for parents shopping for back to school items. Start early, though. The selection will be picked over by the first day of school. There will be numerous sales on small back-to-school items such as crayons and pencils at numerous merchants. Thus, finding the best price on small items could take a considerable amount of work, and result on not saving a lot of money. That’s why we recommend focusing your energy on researching where to get the best deal on big-ticket items such as computers, clothes, backpacks, and other electronics. You can get many of these items for much cheaper a few weeks before schools starts. 4. Look for discount, coupons, and vouchers online! Do you follow your favorite brands on social media networks like Facebook and Twitter? If you don’t, you may want to start. Many companies send their followers and fans coupons via social media, and notify them before big sales. If you want to get the best deals on back-to-school shopping this year, make sure to check out your favorite stores’ social media sites for exclusive discounts. Otherwise, you can check out coupon sites for discount vouchers. Same goes for online stores such as Lazada. They’re known for having huge discounts during certain seasons. Additionally, you can subscribe to their newsletter to be always in the know of the latest deals! As annoying as spam mails may seem, they’re actually pretty helpful once in a while. 5. Shop and compare products online! Shopping online will help you save money in many ways, not just with discounts vouchers and coupons, but also by providing you the means to find and compare products and their prices in different online shopping sites. Price comparison sites such as iprice.ph and pricepanda can help you find the best deals online by allowing you to sort the list of products of your choice according to their prices: from cheapest to the most expensive. Back-to-school is a great time to talk to your friends and other parents to find out what items they have but no longer need. Suggest having an exchange day, where everyone brings unused or outgrown items to swap for items they need. Not only will you save money, but you will also help another local family save money on their back-to-school expenses. There’s really no need to buy a brand new school reference materials such as books. Whether they’re new or not-so-new, they’ll basically have the same contents. The best way to cut down your back-to-school expenses is to buy the books from students of higher grades than your kid. How to find them? Simple! Try to socialize with parents during enrollment season and ask around. You can also join parents-teachers gathering during the start of the school year and befriend other parents. Or, you can simply buy the books from someone you know, it can also be much cheaper that way. It’s no secret that buying in bulk is much cheaper than buying individual items from a retail store. Often school supplies will go on sale late in the summer, which provides you with an opportunity to buy much more for less. When these sales occur, consider buying enough to last your children throughout the entire school year. Having a full year’s supply of essential items like crayons, pens and pencils will help you avoid buying items throughout the year at regular price. As your kids grow older, they will insist on having the “latest and greatest.” They may request Justin Bieber binders and backpacks, and name-brand clothing from the mall. Although your kids crave these items, these “character-focused” products will quickly destroy your back to school budget. In addition, these items often aren’t made to last; many trendy clothing items are very cheaply made. So, set limits with your kids, and speak with them about money-based values. Let your children know that companies should be paying them for advertising their products by wearing name-brand clothing. Show them the difference between a cheaply made trendy item of clothing, and a well-made item without a logo, and explain the difference in quality. Many people don’t want to think about back to school, especially in the midst of high summer. However, back to school shopping can creep up on you and your family quickly, so it pays to be prepared. The best way to save money is to start planning ahead of time, so you can take advantage of every deal and coupon that comes your way.